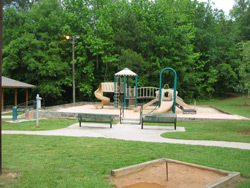 The entrance to this park located at the end of Fields Landing Drive in Canton. 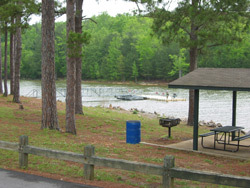 The park is managed by Cherokee County and despite its small size, offers numerous amenities. 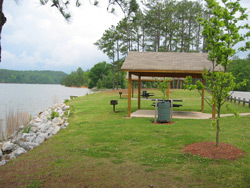 There is a small single-lane boat ramp, a floating fishing dock, individual picnic tables and grilles, a children's playscape and a horseshoe court. The only bathrooms are a number of port-of-potties. There are also two picnic pavilions available for rent. 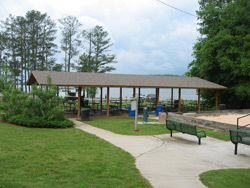 There is a $3 (subject to change) use for for the boat launch, and use of either of the two picnic pavilions requires a reservation and payment of a fee. You can call 770-924-7768 to make reservations and inquire about the cost. One of the numerous individual picnic pavilions is shown on the left. On the right is a picture of the floating fishing dock. 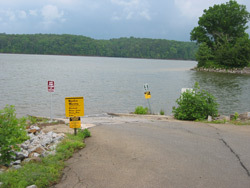 The boat ramp is shown on the left, and the children's playscape on the right. 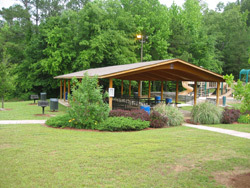 Photos of the large group picnic pavilion that can be reserved, through the Cherokee County Parks Department, for a fee.